Ristorante di Palermo is, as one Palermitan Yelp reviewer made clear, not a Palermitan restaurant. It’s not even a Sicilian restaurant, though they have a couple of Greek/Mediterranean dishes which I assume may be found in Sicily. 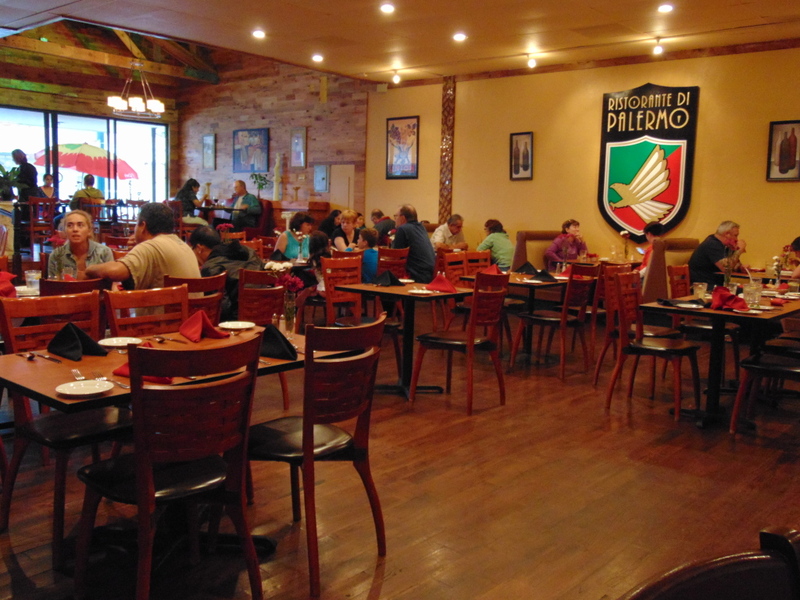 Ristorante di Palermo is your basic Italian restaurant, and as long as you don’t have higher expectations than that, you shouldn’t be terribly disappointed. We went there for Christmas Eve dinner and we had a rather good meal. It was nothing extraordinary, but it was solidly executed and I would go again. We started by sharing the “fungi de portabella” ($12), a grilled portobello mushroom cap in a gorgonzola sauce. The only thing I can fault this dish is the price – $12 is too high -, but flavor-wise it was a real winner. The grilled portobello had a meaty, somewhat smoky flavor and it went very well with the sauce. This isn’t a complicated dish, however, and it’s one I’ll try replicating at home. For our main dishes, I had the chicken marsala ($16), Mike had the salmon special for the night, and the girls had the gnocchi de la casa (in tomato sauce – $12.25) and in gorgonzola sauce ($12.25). Both girls liked their gnocchi, though I didn’t taste them so you may want to take that with a grain of salt. The one in tomato sauce seemed to have plenty of cheese, and I assume the other one shared a sauce with the mushrooms. My chicken marsala had a very nice sauce, it was a little darker than I cook it myself, which I thought was good, and there was some smokiness to it as well. The chicken breast, however, was pretty dry in the manner of chicken breasts everywhere – I wish they would make it with chicken thighs instead. Mike’s dish of salmon with shrimp in some dark sauce was probably the least successful of the evening. He felt the sauce, whose specific flavor he can’t remember, overpowered the seafood. My main complaint about the entrees is that they were in the small size. None of us were left hungry – but I had had an appetizer, the girls don’t eat much (but they cleared their plates) and Mike wasn’t hungry when he started. I think they could increase the portions without hurting their bottom line and make customers’ happier. For dessert, I got the cannoli ($6?). It was quite good, though nothing out of this world, pretty much your standard cannoli. I’d say the same about the tiramisu ($6) that Mika got. Camila ordered the blood orange sorbet ($5), I didn’t taste it but I suspect it was Ciao Bella. It’s a great sorbet and Camila didn’t complain. I had two glasses of the sparkling Barbera ($9 each), which was basically sparkling grape juice with a kick. I liked it, but it’s extremely sweet. Service was very good, our waiter was very attentive. The restaurant is quite nice, but more of a casual place. It’s very roomy, so it’d be a good place to dine when you don’t want to be overheard. I walked past Acqua e Farina several times, on my way to and from my favorite tea house, The Golden Tea Garden, before I noticed its existence. From the outside, the restaurant looked simple and inviting, like an old world, hole-in-the-wall sort of place. I put it on the back of my mind as a place to try some day, and from there I retrieved it last April, when I was looking for a place to celebrate my anniversary, with both my husband and children. We had a great experience then, which I repeated last night with a group of friends. As we discovered once we actually went into Acqua e Farina, this little restaurant occupies the space which was once the home of Rue de Main. The dining room is a little strange, with several smallish eating areas. The largest one is decorated with wall paintings of Italian village storefronts, so you can easily pretend that you are eating al fresco in a piazza. It’s quite nice. The menu is filled with classic Italian and Italian-American dishes. The pasta ones are nicely priced in the low-to-mid teens with meat and fish dishes in the high teens. A porterhouse steak tops the price list at $30. We started by sharing the prosciutto ($8) and the polenta ($7). The prosciutto, which came wrapping thick slices of melon, was good, though this is not a favorite dish of mine. The polenta, however, was outstanding. The baked slices are served with mushrooms in a Madeira sauce that is just out of this world. I’d had it in my previous visit, and it was just as good this time. Don’t miss it. For my main dish, I had the gnocchi della casa ($14), which came with a creamy tomato sauce. The gnocchi just melted in my mouth, and the sauce was quite pleasant. Like most of the entrees at Acqua e Farina, this wouldn’t win any culinary awards, but it was solid. My previous visit I’d had the spinach ravioli in meat sauce ($14), and I had enjoyed them, but not as much as the gnocchi. This time, my friend Katrina had the ravioli but in a pesto sauce, which she enjoyed very much. At a previous visit, one of my daughters had the lasagne di carne ($14.5), which she also liked. Again, no culinary awards, but good, simple Italian food. Acqua e Farina may do even better with its non-pasta dishes. Eddie found her salmone alla griglia, salmon grilled and served with a garlic, basil and fresh tomato white wine sauce ($19.5) to be the best salmon she’d had in a while. Parker, meanwhile, was very pleased with her melanzane del giorno ($12.5), eggplant in a tomato sauce, topped with mozzarella. She found it a big heavy on the cheese for her taste, but thought it was very good. The desserts may be Acqua e Farina’s weak point. My ricotta cheesecake ($6) was light but unexciting, and while I didn’t try Eddie’s lemon sorbet ($4), I did notice she only ate half of her dish. I can’t remember what I thought of the tartufo di cioccolato ($5.5), chocolate ice cream with hazelnuts, which I had in my first visit, which means it wasn’t particularly memorable. Service was outstanding both times. The waiters were attentive and friendly, though this time they failed a bit in the replenishing drinks part. The meal after tax and tip came to about $133. In all, Acqua e Farina is a solid restaurant for when you want a nice night out at a moderate price. I was thinking of cooking Genoese cuisine as part of my International food project, but I finally decided to get to it when I do Liguria. However, I was in need of an easy recipe using boneless, skinless chicken thighs and this recipe for Chicken Genoa looked delicious. Of course, I don’t really know if it is from Genoa, and I did change it a bit (used thighs instead of breasts, sherry instead of wine and fresh mushrooms instead of canned ones), but the results were wonderful. As in seriously addictive, will crave it sort of wonderful. Perhaps the best part about the dish is just how perfectly moist the chicken thighs are. I don’t think I’ve had better boneless thighs. So please, follow the cooking method to the letter. Preheat oven to 350F. Ready a 9″x 13″ glass baking dish or equivalent. Meanwhile, remove any surplus fat from the chicken thighs. Mix the bread crumbs with the Parmesan cheese. Coat the chicken thighs with the egg and then with the bread crumbs. Heat a thick layer of olive oil in a frying pan over high heat. Add the chicken thighs and brown on both sides, about a minute per side. You may need to do this in batches. Place the chicken thighs in the baking dish, careful to not overlap. Use more than one dish if necessary. Top with the mozarella cheese (use as much as you like), and then with the sauteed mushrooms. This is another winner from Epicurious.com. It’s delicious beyond words and as easy a dinner as it gets – though you need close to 2 hours to get it ready. The recipe is pretty similar to a couple of others in my repertoire, but this one took less work. It apparently originates in the Abruzzo region of Italy, though clearly there are variations of the same dish in other regions. I adapted the recipe from the original substituting bacon for the prosciutto. Use less bacon, turkey bacon or ham to make it healthier. I also made a mistake and added additional whole garlic cloves rather than the cloves it asked for. I’m glad I did, as I don’t think cloves would have added much to the dish, while garlic certainly did. Making it a day in advance pays, the leftovers were to die for. Dissolve kosher salt in 1 cup of warm water in a large bowl. Add the chicken pieces and cover with cold water. Cover the bowl and refrigerate for one hour. Remove chicken pieces from the brine and pat try. Place a wide saute pan or similar on the stove over medium heat. Put the chicken pieces, all in one layer. Top with the garlic, sage, rosemary springs, red pepper and peppercorns. Sprinkle bacon uniformly on the chicken. Add white wine. Bring to a boil, then turn down the heat to very low and simmer until the chicken is done, about 35 minutes for white meat and 45 minutes for dark. Add water to the pot if the liquid starts drying out. Remove chicken pieces and bacon onto a bowl and cover to keep warm. Using a slotted spoon, remove and discard the sage and bay leaves, the rosemary sprigs and the garlic. Bring sauce to a quick boil and reduce to a syrupy consistency. Serve.